15 years ago when I founded Little Greene Yoga I would notice a dramatic change in a child’s posture once they started secondary school. This change was down to a number of reasons – carrying extra books, studying, hunched over a desk or the simple awkwardness of adolescence! This posture adaptation is known as ‘forward head syndrome’. About 5 years ago I started to see this same postural imbalance happening among my 8-12 year olds. This coincided with the availability of various affordable electronic tablets. These devices are now part of everyday life, unfortunately so is this posture, now often referred to as ‘text head’. Children’s spines and bodies are now developing problems that can be avoided – their abs (stomach) and pecs (chest) are now in a permanent shortened position; sternocleidomastoid (neck) is shortening; the scapulae (shoulder blades) flare out to the side and the muscles of their upper back are weak and over stretched. This not only causes pain but limits the movement of the diaphragm and the functioning of their lungs. 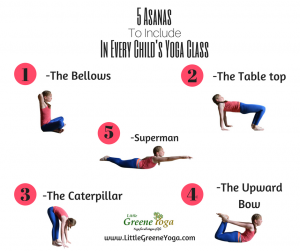 The following 5 asanas, should be included in every child’s yoga class to counteract the effects of modern life and it’s electronic devices! The postures will open the chest and abdomen, lengthen the neck, strengthen the upper back and stabilise the shoulder blades. The instructions for the postures are as you would speak to a child. Remember to make it fun, work them into a game as the kids are not going to want to do them just because it’s good for them! Exhale and bring elbows back to the ears. Push into your hands and feet to lift your bottom off the floor. Keep lifting until your bottom is as high as your knees and chest. Lift your head and chest off the floor.